All of the participants of the contact group on the Ukraine crisis – OSCE representatives, Kiev, Moscow, and the Donbass region – have met in Minsk. No new agreements have been reached, with the meeting ending in a blame game between Kiev and the rebels. The meeting amid the deteriorating situation and intense fighting in eastern Ukraine was held behind closed doors and lasted for over three hours. Ukraine was represented by ex-President Leonid Kuchma. Viktor Medvedchuk, leader of the 'Ukrainian Choice' political organization, also participated as the contact group's special representative on humanitarian issues. Others were Special Representative of the OSCE Chairperson-in-Office, Heidi Tagliavini, and Russian ambassador to Ukraine Mikhail Zurabov. Kuchma, Tagliavini and Zurabov have their signatures under the September Minsk peace agreements, which stipulated ceasefire, withdrawal of heavy artillery from the frontline and exchange of prisoners. The self-proclaimed republics of Donetsk and Lugansk have also sent their envoys to Minsk - Denis Pushilin and Vladislav Deinego. The meeting did not result in the signing of any concluding document, discussions on which continue, Lugansk representative Vladislav Deinego told RIA Novosti. He added that the date for the next contact group meeting has not been discussed. Donetsk representative Dmitry Pushilin also told the agency that the two self-proclaimed republics are ready to comply with the previous Minsk protocol and continue the talks. No new agreements have been reached, with the sides only managing to voice their positions, Pushilin added. 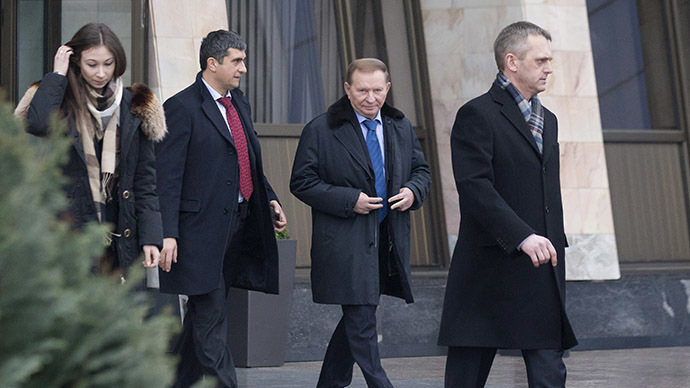 Kiev representative Leonid Kuchma claimed that Saturday's talks were wrecked by the Donbass side. The meeting had no results to help the ceasefire, as "Aleksandr Zakharchenko and Igor Plotnitsky, who originally signed the Minsk documents, failed to attend, and their representatives only made ultimatum-like statements," Kuchma told Interfax Ukraine. Kiev's position remains unchanged, with Ukraine eager to comply with the previous agreements signed in Minsk on September 5 and 19, he added. Plotnitsky denied allegations that it was his side which wrecked the talks. Kuchma previously said he was only ready to have talks with the leaders of the self-proclaimed republics - Aleksandr Zakharchenko and Igor Plotnitsky. “There must be Zakharchenko and Plotnitsky. Those who signed the agreements and who have some power,” he said as cited by Segodnya.ua. Donetsk and Lugansk representatives said that the heads of the territories – Zakharchenko and Plotnitsky - would only come to the meeting in case of a halt in military actions and a new agreement ready and approved by the envoys. The shelling of densely populated civilian areas in eastern Ukraine was on Saturday condemned by the Chief Monitor of the OSCE Special Monitoring Mission to Ukraine, Ambassador Ertugrul Apakan. “I urge all sides to exercise maximum restraint, and fully assume their responsibility to prevent further displacement and suffering, and to redouble their efforts to reach a political settlement,” said Apakan. Vladimir Putin, Angela Merkel, and Francois Hollande have discussed the increased violence in southeastern Ukraine in a phone conversation, the Kremlin's press service said on Saturday. The state leaders expressed their hopes that an immediate ceasefire and heavy artillery withdrawal will be key issues to be discussed at the contact group meeting. At least 12 civilians were killed in Donetsk on Friday. The self-proclaimed republic’s officials said Ukrainian troops shelled the city from a neutral zone north of the airport. 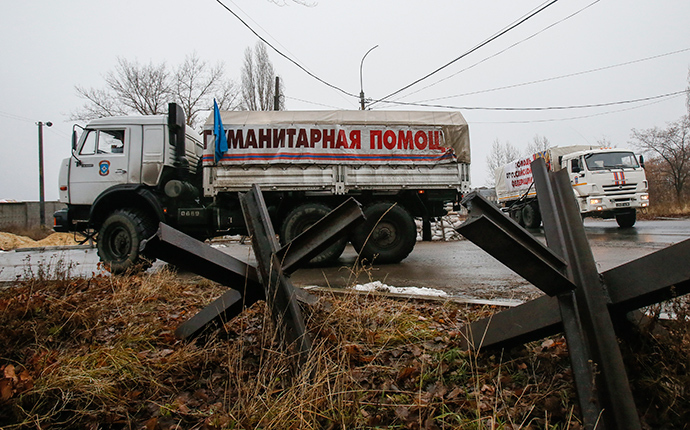 Kiev has blamed rebels, describing the attack as an attempt to undermine the Minsk peace talks. On Saturday, Russian trucks carrying humanitarian aid to the Donbass region were accompanied from the Russia-Ukraine border by OSCE mission observers for the first time. Two convoys of over 170 trucks crossed the border, carrying over 1.5 tons of humanitarian aid including food, medicine, articles of daily necessity, and some building materials. "At the Matveev Kurgan crossing point of the border, the control of the convoy was conducted by both sides, with the Ukrainian border service using specially trained sniffer dogs. After passing the inspection point, the convoy was accompanied by OSCE mission representatives, who were also present during the unloading process," Russia Emergency Services official Aleksandr Lekomtsev told RT. He added that the dogs were used in the process for the first time, and that there were no complaints or remarks regarding the cargo from the Ukrainian side. The convoy was the 12th Emergency Services' humanitarian aid delivery mission, with almost 15 tons of aid previously supplied to the Donetsk and Lugansk regions from Russia. Earlier on Saturday Ukrainian Foreign Ministry official Evgeny Perebiynis commented on the Russian aid convoys, saying the delivery of such aid should be conducted according to accepted international practice and with the approval of Ukraine's government. He added that previous aid freight had been allegedly delivered "with blatant violations of such rules," Interfax Ukraine reported. At the same time, the official said that Ukraine is ready to accept humanitarian aid from foreign states and international organizations. According to the Defense Ministry of the self-proclaimed Donetsk People's Republic, intense fighting in the region continued on Saturday. The Ukrainian army shelled territories near Donetsk more than 20 times on Saturday night, Eduard Basurin of the ministry told journalists, adding that two civilians were killed in the attacks. Fighting has also continued in one of the flash points in the region, in the town of Debaltsevo, located some 55 kilometers (34 miles) from Donetsk. According to Basurin, the Ukrainian army has been fighting with local militia to break out of an entrapment and advance towards the areas controlled by rebels. Kiev, which has up to 10,000 servicemen near Debaltsevo, denied that its troops are being trapped in the town. Over 300 civilians were evacuated from there on Friday, Kiev confirmed.